You’ll find 105 great recipes for easy everyday family dinners and company-worthy weekend meals! like pulled pork and BBQ chicken, or hearty casseroles like four different kinds of Mac & Cheese, pot pies, and enchiladas. Serve up a traditional minestrone soup or go exotic with curried red lentil or Thai chicken. And imagine savoring a delicious stew—braised short ribs, green chile pork, or shrimp and sausage gumbo. Plus great recipes for crisp salads and breads like biscuits and country loaf to serve on the side. All the recipes are easy to make, and come from the trusted food editors of Good Housekeeping, Redbook, and Country Living magazines. Be the first person to tell us what you think about Slow Cooker and you'll save $5 on your next purchase! 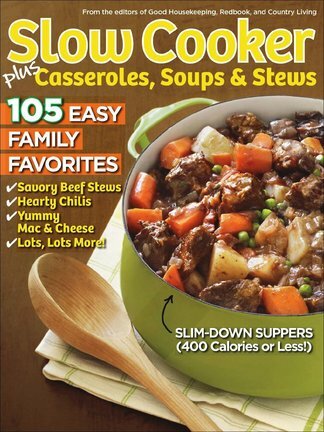 https://www.isubscribe.co.nz/slow-cooker-digital-subscription.cfm 15030 Slow Cooker https://www.isubscribe.co.nz/images/covers/nz/541/15030/square/SlowCooker191610046.jpg NZD InStock /Digital/Food & Wine/Everyday You’ll find 105 great recipes for easy everyday family dinners and company-worthy weekend meals!